Is This Evidence Anne E. D. Rampley is Buried Here? 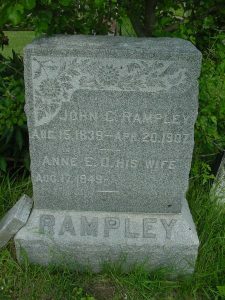 This is the tombstone of John C. and Anne E. D. Rampley is located in the Buckeye Cemetery, Walker Township, Hancock County, Illinois. Does this tombstone provide evidence that Anne E. D. Rampley is buried in this cemetery? Husbands and wives are typically buried in the same location and in the last hundred or so years, it has become common to “complete” as much of the stone as possible at one time. This usually means that everything is put on the stone except the surviving spouse’s date of death. Note the use of the word “evidence” instead of the word “proof.” Genealogists generally reserve the word “proof” for that discussion that encompasses all the records that contain information (evidence) related to a specific event. The stone suggests Anne is buried here and suggests that I perform some additional research. The lack of a date of death could be for the simple reason that no one bothered to have the stone inscribed. ← Are Directories Hiding Deaths For You? Another place to look for substantiation that she was buried there: records from the cemetery, which may give date of burial, etc.